It saddened us to learn that Hall of Fame boxing trainer and commentator, Gil Clancy, passed away this morning. Gil worked with Muhammad Ali, Joe Frazier, George Foreman, Jerry Quarry as well as Gerry Cooney in his bout with Foreman. 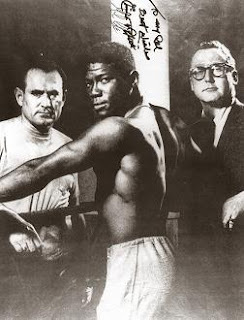 He was the first and only trainer of Emile Griffith, and led him to win both the welterweight and middleweight championships of the world. He was a class act and an asset to the great sport of boxing. He will surely be missed. May he rest in peace. Gil Clancy was born on May 30, 1922. Clancy is a Hall of Fame boxing trainer and one of the most noted boxing commentators of the 1980s and 1990s. Clancy is a member of the International Boxing Hall of Fame. In 1983, he won the Sam Taub Award for excellence in boxing broadcasting journalism. He is married to Nancy Clancy, and has six children and a number of grandchildren and great-grandchildren. After the famous No Más Fight between Roberto Durán and Sugar Ray Leonard was stopped in the 8th round when Duran quit with a “No más! No más!”, it was Gil Clancy who first suggested that Duran must have quit due to stomach distress and probably had to use the bathroom. Ultimately, this turned out to be just about what Durán later said himself. Took over matchmaking duties from Teddy Brenner at Madison Square Garden in late 1978. He held the position for three years.